I usually run a screen using my entry criteria over the list of dividend champions regularly. I do this in order to find attractively companies for further research, which could then be added to my portfolio. I ran the screen a few weeks ago for the dividend champions list, which identified approximately fourteen companies for further research. One reader asked me why I hadn’t included Altria (MO) in the list. Check my latest analysis of Altria for more information about the company. This was a very good question. So good, I decided to write a short post about it. 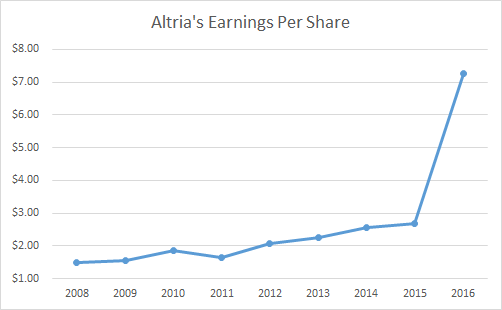 If you look at a place like Yahoo Finance, or Google Finance, you can see that Altria has a P/E ratio of 11. So this means that this amazing company is cheap, doesn’t it? Well, not so fast. As part of our evaluation of company fundamentals, we review trends in earnings per share, dividends per share, revenues and payout ratios over the past decade. 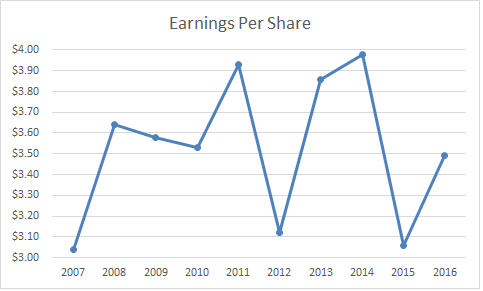 A quick review of the ten year trends in earnings per share shows a bump in 2016. The curious dividend investor would then search for the driver behind the discrepancy. As many of you know, brokerage Loyal3 is closing down in May. I received a lot of responses from readers, who shared their disappointment about the close. I did receive one response, which notified me of another broker that was similar to Loyal3, and which has no account minimums. This broker is called Stockpile, and I will be sharing my observations about it today. Stockpile is an online broker which lets investors buy and sell shares in their favorite companies. It is aimed at newer investors with less experience. The appealing part for me was the fact that it offers the ability to open accounts for kids/teens. This is a feature that may be helpful to anyone who wants to buy stock for children/grandchildren or nieces/nephews, and teach them by example the powerful concepts of investing from an early age. The broker site could be accessed from this link. The brokerage account at Stockpile is SIPC insured up to $500,000 for stock ( and $100,000 for cash). Opening an account is a fairly easy and straightforward process. You need to have your social security number, address, bank information etc.This is a fairly standard procedure. I look at the list of dividend increases every week, as part of my monitoring process. I then narrow the scope by focusing on companies that have increased dividends for at least a decade. I do this in order to focus on companies that have managed to raise dividends throughout a full economic cycle or two. I also focused my attention on the companies which have managed to grow dividends by more than a token amount. My next step involves reviewing trends in fundamentals over the preceding decade, in order to determine if the business is growing. I also try to determine if the dividend is sustainable and can grow in the future. I want dividends that increase due to increases in earnings power. I do not want dividends that increase merely because the payout ratio is being expanded. Last but not least, I also like to review valuations. After all, even the best company in the world is not worth overpaying for. If you overpay for an investment, you may still lose money, even if the company excels on the operations level and meets its growth forecasts. I think I have taken for granted certain topics such as saving, and the power of compounding. I always assumed that it was common sense that people who came to this site would not be interested in learning how I drive a 15 year old car, how I graduated college without any debt but $2,000 in the bank and no debt, and that my frugality has helped me save enough to build my portfolio since 2007. I also naively assumed that everyone who already saves money sees dividend growth investing as a tool to achieve their financial goals and objectives, be that traditional retirement, early retirement, financial independence or something else. Based on many interactions I have had over the years, I think that I was wrong in my assumptions on what constitutes common sense and what doesn’t. Given the rapid growth of the site readership since its inception in 2008, it is reasonable to expect that not everyone will be on the same page when it comes to various topics. The criteria I use have been well publicized over the past decade. They are simple, but effective tools to help me identify companies to include for my diversified dividend portfolio. Obviously, since we are looking only at the list of dividend aristocrats, we are starting out with a group of companies which are already pre-screened for quality. After all, only a company with a strong business model can afford to raise dividends like clockwork for 25 years in a row, or longer. I love companies which can afford to raise dividends like clockwork. Warren Buffett also loves companies that raise dividends like clockwork. Some of Berkshire's largest positions such as Coca-Cola, American Express, Geico, IBM, Wells Fargo are examples of high quality dividend growth stars which have compounded nicely for decades. The first criteria is to focus on companies whose P/E ratio is below 20. I focus on this rule, in order to avoid overpaying for companies. As we all know, earnings per share can be lumpy in the near term, and distorted by one-time events. While they are not perfect, I use forward earnings as a shortcut to quickly estimate earnings power without doing too much digging in the initial stage. The second criteria is to avoid companies which have a dividend payout ratio above 60%. I want to focus on companies that can easily cover their dividend. I take the concept of margin of safety very seriously. The TJX Companies, Inc. (TJX) operates as an off-price apparel and home fashions retailer in the United States and internationally. It operates through four segments: Marmaxx, HomeGoods, TJX Canada, and TJX International. The company raised its quarterly dividend by 20.20% to 31.25 cents/share. This marked the 22nd consecutive annual dividend increase for this dividend achiever. The ten year dividend growth rate is 22%/year. Earnings per share increased from 83 cents/share in 2008 to $3.46/share in 2017. The company is expected to earn 3.91/share over the next fiscal year. Currently the stock is selling for 19.50 times forward earnings and yields 1.70%. Check my analysis of TJX Companies for more information about the company. Raytheon Company (RTN) develops technologically integrated products, services, and solutions worldwide. It operates through five segments: Integrated Defense Systems (IDS); Intelligence, Information and Services (IIS); Missile Systems (MS); Space and Airborne Systems (SAS); and Forcepoint. The company is a dividend achiever, which has managed to grow dividends for 13 years in a row. Last week, Raytheon raised its quarterly dividend by 8.90% to 79.75 cents/share. Over the past decade, the company has delivered an annualized total return of 12.50%/year. This strong performance was driven by the low valuation a decade ago, consistent dividend growth, consistent share buybacks, and strong earnings per share growth.